Adventure | A Guide to Washington D.C. with Kids by Swell Made Co. In May, we took a much needed break and headed to New York City and Washington D.C. as a family (auntie + uncle included). New York City is always fun; but never having been to Washington D.C. as a family, we really enjoyed our time together in a new city. Washington D.C. is beautiful and family-friendly with so much to see and do. And eat! The best part, so many things are free! Known as the Capitol of Free, which is reassuring when traveling as a family. We'll be back again soon. Here is a quick guide to some of our favourite family spots in D.C.
Washington D.C. is known for its food and restaurants. As of late (past decade), the scene has changed dramatically and it shows. Read more about that here. During the week, you'll find food trucks lining the streets around the downtown core, high-end and diverse dining is abundant, and you'll easily find everything in between. Here are a few of our favourite family-friendly choices. My sister-in-law is an expert at finding fun restaurants, so I give her all the credit for helping us track these down. Most of these are (by coincidence) "chainlets". Meaning, you'll find multiple locations throughout the city and surrounding area. Described as a haven for writers, thinkers and performers from America's progressive social and political movements, Busboys & Poets is a restaurant, lounge, theatre and book/gift shop. This casual spot offers southern comfort food (and more) and drinks in a relaxed atmosphere. A love for local, seasonal food fuels this farm-to-table American restaurant. Rustic-chic, you'll find brunch to dinner at this busy spot. Try the beignets and sausage at breakfast and a cauliflower steak for dinner. Need to nosh on the go. Kids love pizza, am I right? We, The Pizza has NYC style pizza by the slice or pie. Wash it down with homemade sodas. Ted’s Bulletin is an American classic with a bit of style, complete with savoury homemade food and a family friendly atmosphere. Try the homemade pop tarts, pies, and cakes. Kids and adults will love the shaketenders and baristas who can whip up a custom milkshake — with or without alcohol (seen below). Handcrafted daily, District Doughnuts offers delicious pastries with signatures flavours: Brown Butter and Salted Dulce de Leche. They serve the nation's capital with a penchant for classic and internationally-inspired flavours and a commitment to Washington's history and creative spirit. As mentioned above, Washington D.C. is the "Capitol of Free", so don't worry about breaking the bank. And for Canadians, this makes the current exchange rate easier to swallow. From concerts, festivals/events, renowned galleries and museums, there are so many things to do as family for free. Or, almost nothing. This stands true for anytime of year. Come to Washington D.C. to see the Smithsonian museums, galleries and zoo and you pretty much have your trip planned. There are so many intriguing properties and collections to see. Kids will especially love the Museums of Natural History, Air and Space and American History. Parents will love a little quiet time in the American Botanical Gardens and National Art Galleries (including the outdoor sculpture garden) and the Renwick Gallery (seen below), which are also great for kids. While not downtown, don't forget to take trip to the zoo and explore the animals and park system. The best part of all, everything is FREE! Giving you a chance to visit them all, not once, but as many times as you like. Not free like the Smithsonian museums, but high on entertainment value, this museum guides you through an exciting look at the history of spies. Our kids are 7 and 4 and they thoroughly enjoyed this museum; although I'm sure older kids would get more out if it. Be sure to let staff know you're a family and you'll be given a special task with a surprise at the end. My 7 year old daughter loved solving puzzles and deciphering secret messages as we learned about spies. It had an "escape room" vibe which is fun (not scary). The Newseum promotes, explains and defends free expression and the five freedoms of the First Amendment: religion, speech, press, assembly and petition. Considered one of the most interactive museums in the world, the Newseum experience also traces the evolution of electronic communication from the birth of radio, to the technologies of the present and the future. I'd recommend this museum for "bigger kids" (10 and up). Take a break from the tourist spots and explore the neighbourhoods of Washington D.C. where you'll be delighted by "epic" playgrounds (Palisades Playground seen below). See a list of the best ones here. D.C. is lush and green and full of parks, trail systems and gorgeous neighbourhoods to enjoy the outdoors and be active. This is the best way to live like a local and explore. If you want to get wet, check out the Yards Park at the Capitol Riverfront in the summer (or skate in the winter). You can certainly walk the parks; and if you're so inclined, see the outdoors from a kayak or paddle boat along the scenic (a tidal basin) Potomac River. When you visit Washington D.C. be sure to see what's on at the "Ken Cen". There are free performances on the Millennial Stage every night at 6 pm! Regular performances start shortly after and tickets are reasonably priced. The types of performances vary from folk music to orchestra and so much more. There's something for everyone. You can't visit Washington D.C. without a trip to The Mall. Take a walk among the monuments and visit the galleries and museums that line it. There's lots of room to move about as a family, and so much to learn about American history. Use the Circulator to get around easily from site to site. It's a bus system designed for those touring the sites with regular frequency. It's a $1 to ride each time (kids are free). The routes also extend beyond the mall. I didn't get into accommodations, but there are plenty of places to stay in Washington D.C. As a group of six, we found it best to rent an apartment through Airbnb to give everyone a bit of space. It also allowed us to explore neighbourhoods like Mount Pleasant and Columbia Heights away from downtown, which I'd highly recommend. We just happened to be steps from one of the zoo entrances which was a huge bonus with kids. 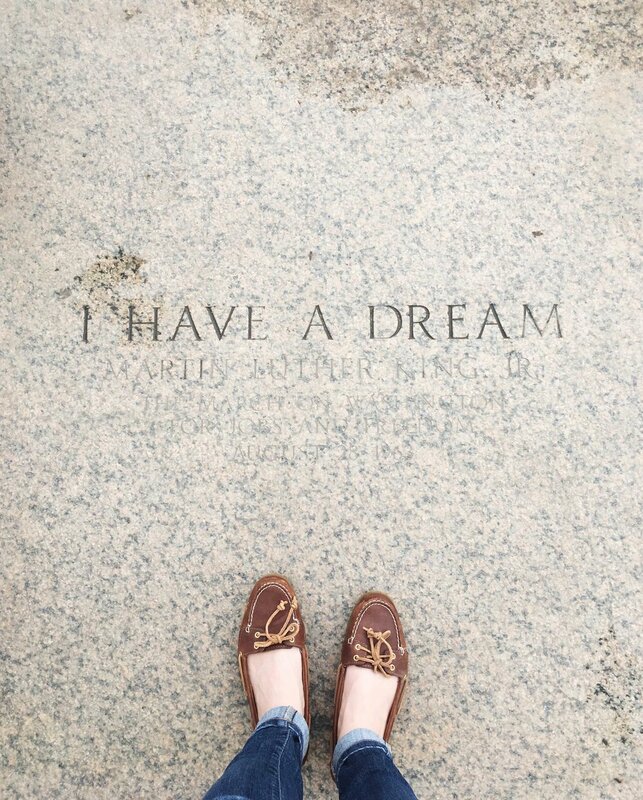 Adventures with Kids in Washington D.C. | Lincoln Memorial. Martin Luther King Jr. Quote.